Catherine Elizabeth Tristram was born in 1931 in Worcestershire. Initially attending Stourbridge High School she went on to to Somerville College, Oxford, gaining BA degrees in Modern History (1953), Theology (1955) and an MA in 1957. Her career in teaching began at 'Bedford High School' in 1955 and in 1960, having reached the post of Head of the RE Department, took up a position in higher education as a lecturer at St. Hild's College, Durham ultimately becoming the Head of Theology. Following the amalgamation of St.Hild's and St.Bede's college, in 1975 she was appointed Head of Religious Studies Department from which she retired to become Warden of Marygate House, the ecumenical retreat centre, on Holy Island in 1978 enabling her interest in church ministry to develop. In 1983 she became Deaconess of the 'Parish Church of St.Mary the Virgin, Holy Island' and 1994 one of the very first ordained female Anglican Priests. 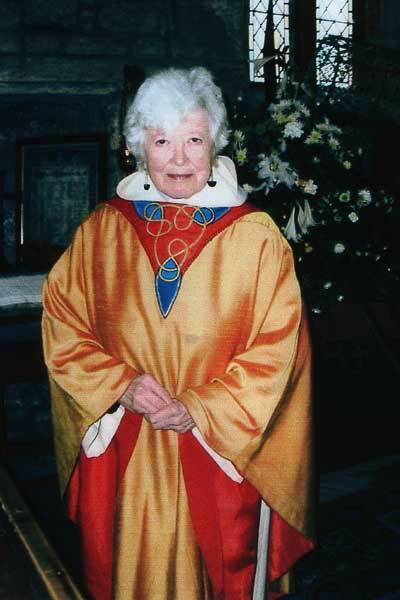 It was in this year that her services to the church was recognised and she was appointed an Honarary Canon of Newcastle, the title now emeritus upon her retirement from the church in 2001. Kate's all-consuming hunger for breadth and depth of knowledge is ever-present. Even on Holy Island she was drawn back to academia and in 2000 achieved an MSc in 'Medieval Language and Text' at Edinburgh University. Indeed she is widely recognised as an authority on medieval christianity and lectures on around the world. Kate has devoted much of her time to our busy Parish Church and regularly presides. She has seen the community safely through two inter-regnums and is an elected member of the community development trust. Her knowledge and acceptance by the Island community enables her to work effectively as the editor of the monthly newsletter, 'Holy Island Times, for which this series of articles were originally produced. She continues to spend an extremely busy retirement writing and working within the church and for the community.